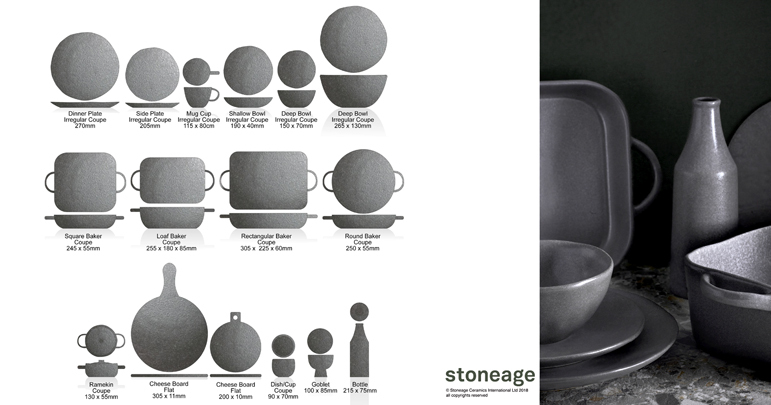 In this edition of the Stoneage Blog we are excited to share with you a selection of our recently created ceramic dinnerware and bakeware designs, as presented to (and loved by) customers that visited our Hong Kong Showroom last October. 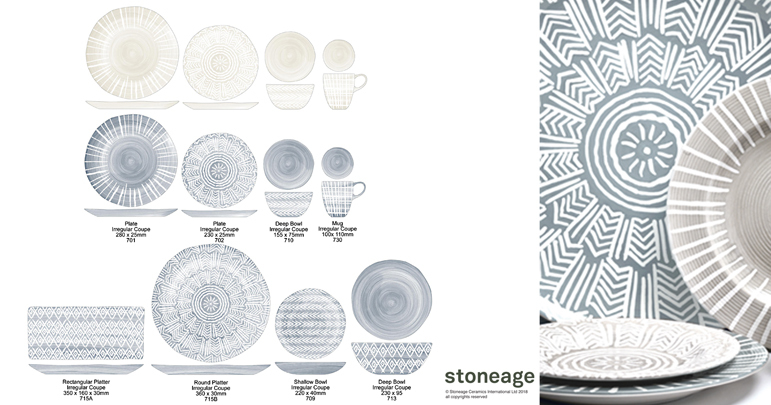 Taking inspiration from batik textiles and ethnic tribal prints, Inti is a mix and match dinnerware and serveware range with an earthy and tactile look and feel. Stark white pattern is masked out against watery brushed colour, the neutral monotone palette ensures that the bold pattern isn’t too heavy and maintains a laid back, casual feel. In keeping with the strong trend of artisan-made pottery looks, Salt is a rustic and beautiful range of stoneware dinnerware pieces. 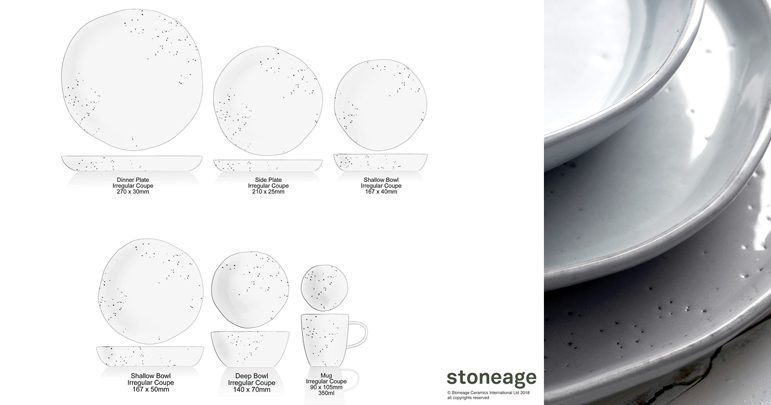 The irregular shapes are designed to look hand-thrown and individual and are covered in a milky, dimpled reactive glaze. A splash of feminine colour, a spray of flowers and a spot of precious gold, Paintbox was designed for ladies (and gentlemen) who brunch. 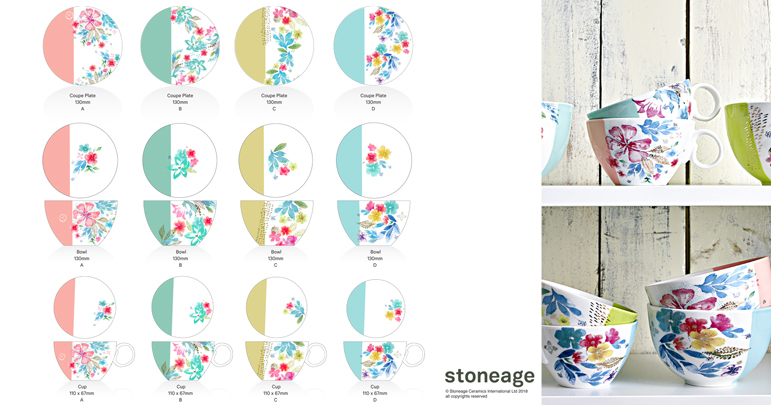 This collection of mix and match bowls, plates and cups was designed to be fun, fresh and bright, as a mid morning pick-me-up to help you face the rest of your day! Inspired by traditional Japanese ceramics, Kuro is a dark and moody range of utilitarian ceramic dinnerware, oven-to-table ware and serving pieces – everything you need for impressive entertaining or a simple night at home. The organic profiles and charcoal reactive glaze makes this range more akin to slate than ceramic and right on trend, looking perfectly at home in the modern kitchen. Origins is a practical dinnerware range perfect for casual everyday use, decorated simply with a debossed design and accentuated with watery translucent glazes. 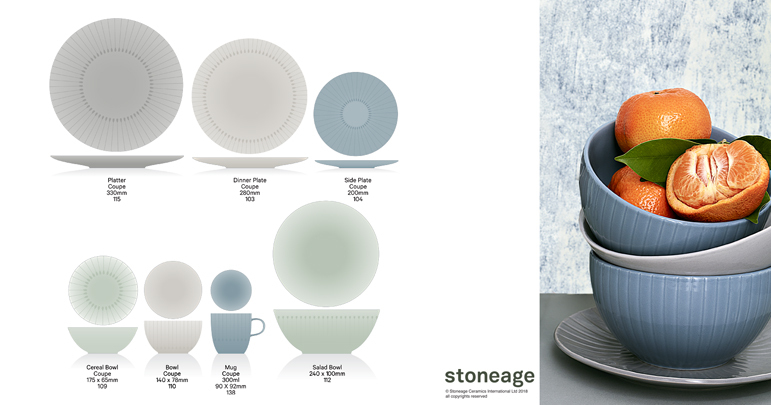 Soft calming colours were chosen for the range with the ability to mix and match together or as a matching set, Origins dinnerware looks good against a modern or traditionally decorated table setting. If any of these new designs are of interest to your business please contact our merchandising team for more information. 1. All content on this blog is provided for information and opinion purposes only. Stoneage makes no warranty as to the accuracy, reliability, validity or suitability of the information contained on this blog (including, but not limited to, any content or information on this blog by Stoneage or on behalf of Stoneage or by any third party). 2. This blog and the information, names, images, pictures, logos and icons, products and services (including third party products and services) included in it is provided without any representation or endorsement made and without warranty of any kind whether express or implied. In no circumstances will Stoneage be liable for any loss or damages including, without limitation, negligence, any direct or indirect loss consequential and economic damages or any damages whatsoever arising out of the use of or in connection with this blog or through any person relying on anything contained or omitted from this blog. To the extent permitted by law, Stoneage excludes all conditions and warranties that may be implied by law. 3. Any links and pointers to websites operated by third parties do not form part of this blog and are not under the control of Stoneage. When you link to those websites you leave this blog and do so entirely at your own risk. Stoneage makes no warranty as to the accuracy or reliability of information contained on any third party website and Stoneage, its related entities, directors, officers and agents disclaim all liability and responsibility for any direct or indirect loss or damage which may be suffered by you through relying on anything contained on or omitted from such third party websites. A reference or display of advertising on this blog does not imply an endorsement or recommendation by Stoneage. 4. This blog may contain content provided to Stoneage by third parties. Stoneage does not monitor or make inquiries about content provided to Stoneage by third parties. Stoneage is not responsible for, does not endorse and makes no representations either expressly or impliedly in respect of any content provided to Stoneage by third parties. Such content does not represent the views of Stoneage and you rely on content provided by a third parties completely at your own risk.